Munich Germany Weather - When is the Best Time to Visit? 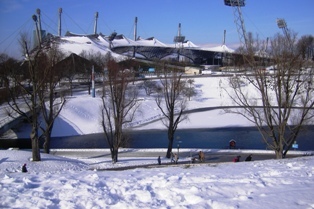 Munich Germany weather and climate belongs to the temperate zone. That means we have four seasons: Spring, Summer, Autumn and Winter. Officially the seasons always start on the 21st of March, June, September, and December. Off course the weather doesn't know that and there are now sudden changes from one day to the next. 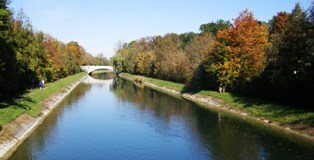 Due to Munich's location in the South of Germany, far away from the next ocean, the Munich weather is more like the Austrian temperate continental climate than the Germany climate that is classified as temperate marine. This means we have cold winters with frequent rain in lowlands and snow in the mountains and hot summers with occasional showers. Temperatures can vary between -20 degrees Celsius (-4°F) in winter and +35 degrees Celsius (95°F) in summer time. 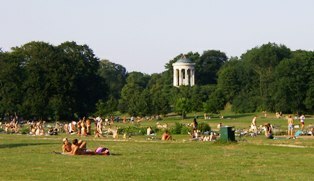 Munich Germany weather (especially in the city center) can be very hot. We've had summers with temperatures constantly reaching or even surpassing 30 degrees Celsius (90°F). Enjoy the time as much as you can, because it probably won't last long. The next rainy days are guaranteed. Yes, unfortunately not even in July or August is it guaranteed that you'll have sunshine all the time. So bring your rain jacket and a sweater at any time of the year. But don't despair, there's enough to discover in Munich during a rainy day or week. Days are getting shorter and the trees are changing their color to splendid yellow and red tones (we call it "Altweibersommer", the German equivalent to the term Indian Summer). Oktoberfest and several other festivals are about to start, and you'll have the unique opportunity to see persons from all over Bavaria showing up with their Dirndl and Lederhose (traditional clothing). People who don't like hot and dry climate (and apparently most of our friends belong to that group) will tell you, Autumn is the best time of the year to be in Munich. Again, you can be unlucky and have a lot of rain, but in general days will be sunny and still warm until end of Oktober. In November the Munich Germany weather changes dramatically: days are a lot shorter now and it usually is cold, rainy, grey and foggy. As I write this (10th of November) you can't see more than 50 meters because of the fog. The air is cold and very humid, you can almost feel the water creeping into your clothes and your bones. In my opinion, November is the worst month of the year to visit Munich. Chances that you can do a lot of outdoor activities are slim. I like winter! Not as much as I love summer, though. In December when temperatures fall way below freezing point, the air is crisp and fresh, snow flakes slowly fall down from the sky, a quiet and mysterious spirit settles down in the city, and all life seems to be slower and more peaceful. Then you know, it's Christmas time. Come in winter for the famous German Christmas markets, Glühwein (hot wine with spices) and not to forget, to ski in the nearby mountains. In January and February, days are getting longer again, it's still cold, but often very sunny. Fantastic days to be outside and enjoy the white landscapes. is so eagerly awaited by humans as well as animals and nature. Everyone and everything awakens to a new life. In March, April and May days become longer and warmer, the sun shows up again for more than a few hours per day, nature looks green and refreshing, flowers blossom and the mood of Munich lightens up. Spring is the perfect time to visit Munich if you want to be here before the crowd arrives in summer. 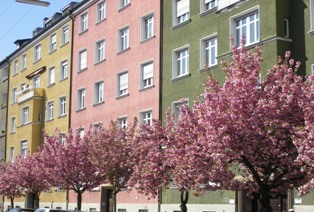 Enjoy with the locals Munich Germany spring weather and see how the city transforms from her winter lethargy into lively spring atmosphere. May and June are probably the best months to enjoy Munich. You have almost summer-like weather without being too hot and there aren't as many tourist as during high season.